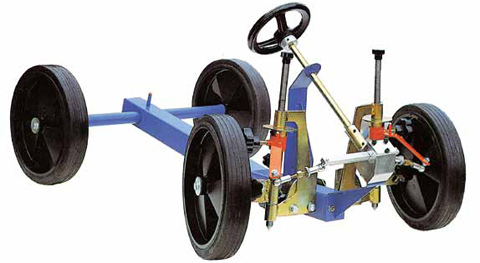 It is a rational training model which allows an easy explanation of the difficult steering geometry. In particular the teacher can clearly show the effects of the steering trapezium. This model can be arranged on the ground to simulate driving conditions. It is provided with active suspensions. The wheels can be adjusted separately to emphasize all the faults which can occur in a car having fore carriage functional defects.